When you get to work in the morning, whether it be in a nice office somewhere, that little coffee shop down the street or simply in your spare room, what’s the very first thing you do? Grab a coffee? Yeah, me too, but after that what do you do? I know one of the first things on my list every day is to check what emails I’ve received whilst I’ve been in the land of slumber (in fact it’s a really bad habbit of mine that I read client emails as soon as wake up whilst I’m turning my alarm off!). When you’re running a business and dealing with clients day in day out, you send way more emails than you think. I’ve sent 12 emails today already and it’s only 2:30. Say for instance though that this was all I sent out in a day, that’s 60 emails a week, 240 emails a month, 2880 emails every year, it adds up. Now those emails go out to a whole host of people, some to current clients, some to new clients, some to other designers and some to printers. The point is that in a year I reach thousands of different people (and possibly more through forwarded emails) in my industry just through my email. Now whilst I may not give out thousands of business cards every year, there is no reason why my company details can’t be falling into the laps of thousands through my email. You don’t have to include all of these details but stuff like your name, company and website should really be on there if you want it to be useful. If there are a few of you running your design company then make sure you all format your email in the same way. If each of you has your own style of signature, it’s akin to you handing out different styles of business card. Also if you’re including your email and website, then make sure they are clickable links! If your recipient has to copy and paste your website address before they can see what you’re about then that isn’t a very good signature. Some (but not all) email clients allow you include an image in your email signature. Now this may sounds like a great idea, but it can be a bit of a double edged sword. In most email clients a recipient must click to view images before they are downloaded so there is a chance that they may not see your image at all. Worse still if you’re emailing somebody for the first time, their email client may see the image as an unknown attachment and divert your mail straight to spam just in case it’s a virus! Now that’s worse case scenario and I know a lot of successful design houses that use very clever images in their email signatures so don’t worry about it too much. One thing I will say though is don’t include any of your contact information in an image. It may be tempting to bypass the stuffy email formatting by placing all of your details cleverly in a jpeg, but if your recipient doesn’t click to view your image then all of your details are lost to them and it can look very unprofessional. Your signature doesn’t have to just be about the formalities, you can also use it in a variety of creative ways to help promote your business alongside your contact details. You could mention any new services that your company has. This can be a great way to let any clients who aren’t signed up to your newsletter know about that new web developer your just hired. Invite them to an industry event that you’re going to. Having a chance to meet this person face to face could help add solidarity to your relationship. Let them know about any offers you have going on at the moment, or that they’re eligible for special rates just for receiving this email from you! Mention that you offer consultations for free or at a discounted rate, this could encourage any potential clients that are wavering to go that one step further with you. Include links to your social media pages like Twitter and Facebook, everybody likes to waste a bit of time right? Now every email client is different and the exact method of setting up your signature may change from service to service, so here I’ve focused on how to use Gmail as this is not only a great email client, but also allows you to run other email addresses through it, making it a really effective ‘hub’ for your email activity. Once on the settings page, make sure you’re on the ‘General’ tab and scroll down until you see the ‘Signature’ section. 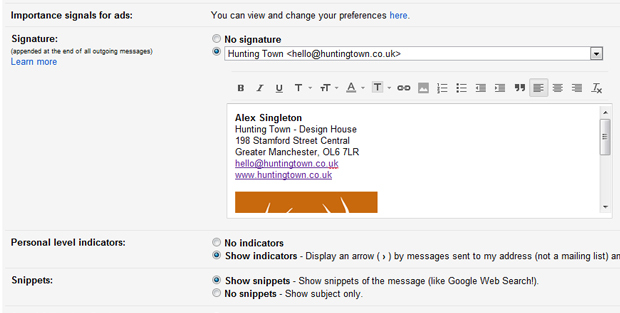 Here you can choose which email address to attach each specific email signature to from the drop down box (I have hello@hutningtown for general enquires (and so doesn’t contain my personal number) and alex@huntingtown for direct client contact. In the box below you simply write in what you want your email signature to be. Gmail is particularly good in this respect as they have included all of the formatting tools that are available in their general email window, so adding links to web pages and emails is a cinch. So there you are (told you it was simple! ), hopefully you’re already utilising your email signature in some way, but I hope this article has given you some ideas of how you could potentially improve it to try and squeeze a little more business out of all those emails you send every year. If you have any other ideas or suggestions on how to utilise an email signature, I’d love to hear about them in the comments below.